Asheville NC and the Western North Carolina surrounding areas are located right along the border of the Pisgah National Forest. In fact, much of the forest and woodlands in Buncombe County are considered part of the Pisgah National Forest which runs along the northern section of the Western North Carolina state line. The national forested lands make this area especially beautiful and the Asheville NC mountain real estate found here is full of preserved landscapes and views. Browse through our Asheville NC mountain real estate listings. Several of our properties are located near to or border the national forest. Many people come to the area in search of their own private estate in the mountains. Several of the communities we list properties in are located right along the national forest. Look for homes in land in the communities of Hawk’s Ledge and Wolf Creek Ranch, you’ll find panoramic views and naturally preserved areas. What’s so wonderful about living along the Pisgah National Forest border? Naturally, the appeal of having the Pisgah National Forest in your back yard is the outdoor recreation and wildlife you will get to be a part of. Watch deer drink from a stream, enjoy trout fishing or even rock climbing just a short drive from your home, or sit on your front porch and enjoy the peaceful sights and sounds of nature. Hiking, mountain biking, rock climbing, fishing, horseback riding, and even whitewater rafting are all possible when you live close to the Pisgah National Forest. The views and landscapes are also breathtaking, making this some of the most sought after real estate in the state. 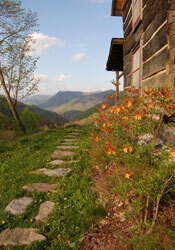 Let Mountain Home Properties help you with all your Asheville NC mountain real estate needs. We list and sell homes and land in and around Buncombe County and are your experts on the Western NC real estate markets. Contact us today and let us know how we can help you.